KENNEDY SPACE CENTER, FL--An electrical glitch with the shuttle Endeavour's hydraulic power system forced NASA managers to scrub Friday's planned launch on a space station assembly mission, disappointing thousands of spectators and spoiling a visit by President Obama and his family. It also was a disappointment to commander Mark Kelly's wife, Gabrielle Giffords, who flew to Florida Wednesday to watch the launching as she recovers from a January assassination attempt. "So, a disappointing day for team Endeavour and the astronauts," said Launch Director Mike Leinbach. "But as we always say in this business, we will not fly this machine until it's ready. And today, it was not ready to go." NASA managers do not yet know what it will take to resolve the problem, but they are hopeful a faulty thermostat in a heater circuit is to blame. 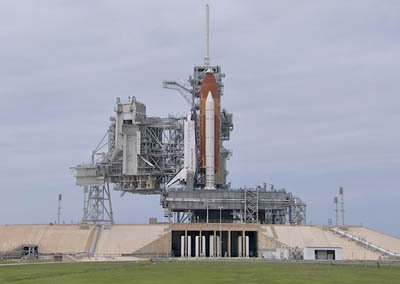 If so, the shuttle could be ready for another launch attempt as early as Monday at 2:33:56 p.m. But if the problem requires a cockpit fuse panel swap out, or installation of a replacement electrical box in the shuttle's aft engine compartment, Endeavour's launch on its 25th and final mission could be delayed until May 9 or 10, after the planned May 6 launch of an Atlas rocket carrying a missile early warning satellite. Because of a conflict with the planned undocking of a Russian Soyuz spacecraft from the International Space Station at the back end of the shuttle's mission, "we'd probably move to the 9th, maybe even the 10th as our first launch attempt on the other side of Atlas," Moses said. "We're going to have to go do some homework there and talk to the Russians about exactly the right way to deconflict that," he said. "But we're not going to do too much on that just yet because we think we've still got a shot in front of Atlas." President Obama and his family toured tornado-damaged Tuscaloosa, Ala., early Friday and continued on to Florida, landing at the Cape Canaveral Air Force Station as planned shortly after 2 p.m. The first family then boarded a Marine helicopter and flew to the nearby Kennedy Space Center, flying past launch pad 39A for a bird's eye view of Endeavour. The president and his party toured an orbiter processing hangar, getting a close-up look at the shuttle Atlantis, before moving onto the Launch Control Center where he met with Endeavour's crew, Giffords and other astronaut family members. Obama enjoyed "a great tour of Atlantis over it the Orbiter Processing Facility, came over to the LCC (Launch Control Center) and met with the crew," said spaceport Director Robert Cabana, a former shuttle commander. "The crew is in great spirits, he had a long conversation with them. Then he met with the crew families and talked to some folks along the way." The president's meeting with Giffords was not recorded and a few minutes later, Obama flew on to Miami. Endeavour's problem cropped up during fueling when engineers noticed apparent problems with two heater thermostats used by one of the ship's auxiliary power units. Space shuttles are equipped with three APUs to provide the hydraulic muscle needed to move wing flaps, main engine nozzles, landing gear brakes and other critical systems. While a shuttle can safely fly with a single APU, NASA flight rules require all three to be operating normally at launch to ensure redundancy. In this case, the concern was the possibility a fuel line could freeze, leaving APU No. 1 just one failure away from a shutdown. As engineers were assessing the problem, Kelly and his crewmates -- pilot Gregory H. Johnson, Michael Fincke, Gregory Chamitoff, Andrew Feustel and European Space Agency astronaut Roberto Vittori -- were preparing for launch, going through final medical checks and donning their pressure suits before heading to the launch pad. But they knew a potentially serious issue was under discussion and a few minutes after noon, Leinbach called off the countdown and ordered a scrub. The "astrovan" carrying Kelly and his crewmates stopped at the Launch Control Center, paused briefly for a call from Leinbach, then turned around and headed back to crew quarters. Engineers, meanwhile, drained Endeavour's external tank and held meetings to review data from the ship's hydraulic power system. "The exact problem was a thermostat on one of the fuel lines for that auxiliary power unit and we need to keep those lines warm to prevent them from freezing on orbit," Leinbach said. "So we have two thermostats, two heaters for each fuel line for each APU." "And on auxiliary power unit No. 1, one of those two heater units failed and the trouble shooting we did on it proved it was a hard failure, we were not able to get it to come to life no matter what we did. "We tried to let the line cool down just by normal means to see if the thermostat on that heater would kick in. That did not happen. We tried to command the heater from the cockpit of the orbiter, that did not happen either. So we know we had a hard failure in that heater string for that one auxiliary power unit. There was another heater upstream of that that's also exhibiting some funny behavior." It is possible the "signature" can be explained by a single faulty thermostat. If so, engineers should be able to install a replacement in time for a second launch attempt Monday. "If there's a thermostat that's failed such that it might have an open circuit in it, not necessarily a short circuit but just an open, that would open up to ground," said Mike Moses, chairman of NASA's Mission Management Team. "These things are wired together such that all the heaters on the front half of that string share a common ground. ... So a single failure on one thermostat could still cause this problem." That's the best-case scenario for NASA. "The troubleshooting involves taking in a can of (compressed air) and spraying it on the thermostat to see if we can force a lower temperature on the thermostat and have it kick on," Leinbach said. "If that works, we might have just a thermostat that's out of kilter and we can replace that thermostat and we'll be in good shape. "If it's more than that, then it could be in a box called the LCA. the load control assembly, which is essentially a box full of switches. If there's something wrong in that box and we have to change out that box, that's a much more extensive job. It would take us quite some time to do that." Engineers hope to climb in the aft compartment Saturday afternoon to begin troubleshooting. A final decision on how to proceed is expected by midday Sunday at the latest.